Captain John Chaddock's ship blew up at Battery Street in the North End. Five men lost their lives. Soon after, unexplained lights appeared in the sky. The citizens of Boston eventually ascertained that one of Chaddock's men had conjured up the spirits of the dead sailors, which was the origin of the mysterious lights. Chaddock was essentially a pirate, and had previously attempted to colonize Trinidad with a party of Bostonians. "Exactly 16 days after the blowing up of Capt. Chaddock's ill-fated ship and crew, and just at 'the witching hour of midnight,' as Shakespeare calls it, 'when churchyards yawn and hell itself breathes forth contagion in the air,' three men in a boat, coming toward Boston—a strange hour for reputable puritans to be so far from home—saw two bright lights rise out of the water, at the place where the vessel had been blown up, just off the [old] North Ferry slip. They made the still more inexplicable [observation] that the two lights assumed the form of a man, and sailed leisurely off over the water to the south, keeping but a short distance from the shore, till it reached a point now occupied by Rowe's Wharf, at the foot of Franklin St., where it vanished as suddenly as it had appeared just 15 minutes before. The story was told and retold about the town, for the next few days, till the whole population had reached a mental condition that made them capable of seeing the ghosts of Chaddock's buccaneers, if given any kind of chance. A week after the event just described, the old records say, 'the twin lights were seen again by many,' but this time they arose off Castle Island, and after traveling through the air just 12 minutes, vanished at the spot where the remains of the ship were resting. The restless spirits of the deep continued to make things satisfactorily terrifying for those who were 'out late 'o night' along the waterfront. 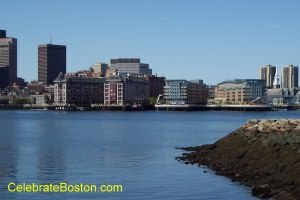 On one occasion, the story was, that at 8 o'clock, a light resembling the moon rose from the water at the wreck, sailed through the air till it was over the highest point of 'Nottle's Island,' now East Boston—but then uninhabited, and an ideal place for ghostly gambols—and there it was met by its twin light, the two suddenly merging into one, then parting, and thus continuing uniting and separating, as if in playful mood, many times, all the while 'shooting out sometimes flames and sometimes sparkles.' Finally, uniting permanently, the big illuminated disc floated off behind the hill on 'Nottle's Island,' disappearing from sight of the wondering eyes of Bostonians. Three weeks after the perturbed spirits first began their peregrinations they went finally to rest, as far as our local annals testify, and on their last appearance the agonizing voice had been transferred to the scene of the wreck in the North end. The public discussion stimulated by the phenomena brought out the fact that the man who snapped the pistol that ignited the powder that blew up the ship that released the ghost had professed to be a necromancer [a communicator with the spirit world], and was known to have done many wonderful things during his last voyage, and was also suspected of having murdered his master some time before in Virginia, though unfortunately these important facts had not been imparted to the local authorities until the necromancer had done his worst. It was considered a matter of especial significance that all the bodies of the crew, save only his, had been recovered before the spiritualistic manifestations began, and, as it was considered one of the cardinal principles of ghostly etiquette not to walk—or even fly—by night, after one's 'earthly tabernacle' had been given a reputable internment, it was reasonably clear that the cause of the psychic disturbance must have been the failure to recover the body of the missing sailor." In 1639, the first UFO sighting occurred over Boston Harbor, and then a major UFO sighting took place at New Haven, CT, in 1647.